PRINCETON, N.J. -- The percentages of U.S. households and individuals reporting that they have been affected by crime in the past year have not changed much in the past three years. 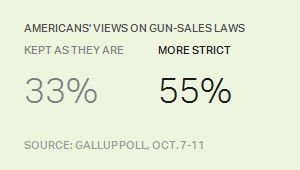 Twenty-seven percent of Americans currently say someone in their household experienced at least one of seven different crimes Gallup has tracked annually since 2000, and 17% of individuals were themselves the victim. 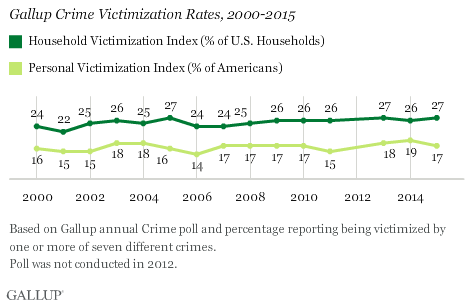 Today's self-reported crime victimization rates, from Gallup's annual Crime poll conducted by telephone Oct. 7-11 with 1,015 U.S. adults, are similar to what Gallup found in 2013 and 2014. And although there has not been much variation over the years, today's rates are on the higher end of the range seen in Gallup's 15-year trend. The average household victimization rate of 27% over the past three years is a bit higher than the 24% average recorded between 2000 and 2004, and the index has not registered below 26% since 2008. 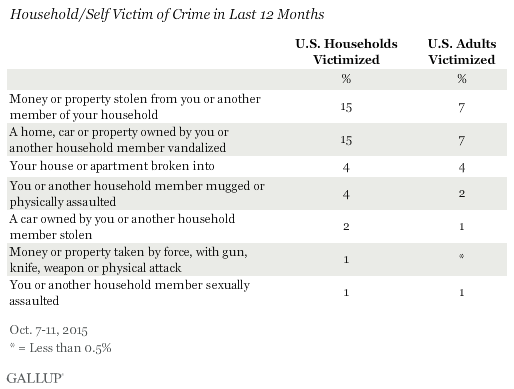 Both the household and personal victimization indices reflect U.S. adults' responses to questions asking whether they or anyone in their household was the victim of each of seven types of conventional crimes: theft, vandalism, burglary, mugging or physical assault, auto theft, robbery and sexual assault. Those who said yes to the broader question for each crime were subsequently asked whether it happened to them personally or to another family member. Of the 27% of households affected by crime in the past year, 16% were victimized by one crime and 11% by two or more. Also, 6% of households and 3% of individuals experienced at least one violent crime; the rest were limited to property crimes. Of the seven crimes included in Gallup's crime victimization indices, the most common -- both for individuals and for households -- is having money or property stolen, as well as having a home, car or other property vandalized. Each of these crimes was experienced by 15% of households in 2015, including by 7% of individuals. Being mugged or having a house or apartment broken into is the next most commonly experienced crime, although with substantially fewer households -- 4% -- affected. The rate drops further for having a car stolen, experienced by 2% of households, as well as having money stolen by force or being sexually assaulted, both 1%. Mirroring the recent stability in the overall index, the victimization rates for each of the seven component crimes have also been steady. 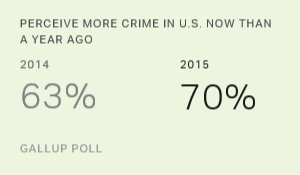 Gallup added two cyber-oriented crimes, credit card fraud and identity theft, to the survey more recently. They are not included in the crime victimization index due to the need to maintain the long-term comparability of the index. As Gallup reported earlier, the percentage of Americans victimized by credit card theft or fraud fell to 22% this year from 27% in 2014, possibly reflecting fewer hacking incidents occurring at major U.S. retail stores in the past year coupled with increased security features on credit cards. 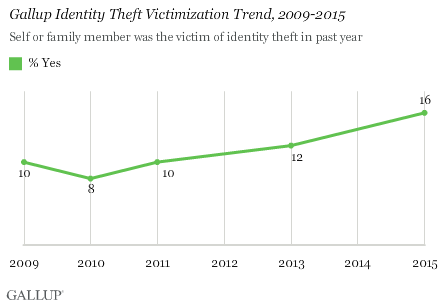 At the same time, the percentage of Americans reporting that they or another household member was the victim of identity theft rose to 16% this year from 12% in 2013, and is the highest Gallup has recorded of the five times it has been included in the survey since 2009. 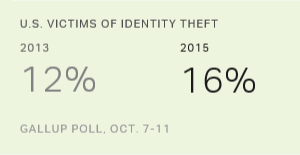 Ten percent of U.S. adults say the identity theft that occurred in the past year happened to them personally. Although the percentage of U.S. adults and households experiencing property and violent crimes has been fairly steady over the past few years, slightly more households are affected now than in the early 2000s. Additionally, the prevalence of identity theft appears to be rising, perhaps reflecting the greater security risks Americans face as they spend more time online. 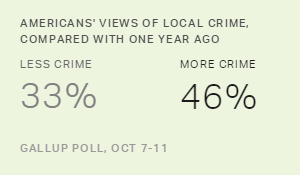 Gallup will provide additional insights on its crime victimization trend in a forthcoming analysis that focuses on demographic differences in self-reports of crime.